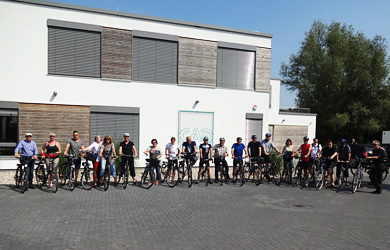 Sponsored cycling in support of refugees was a major success: CAD Schroer’s sponsored cycling raised enough money to buy 50 bicycles for refugees housed in Moers. Our staff cycled over 8,000 kilometres. Cambridge, UK and Pittsford, NY – 29 October 2015: Staff at CAD Schroer pedalled hard for a month to convert every kilometre cycled into a donation. And it certainly paid off, as over 8,000 kilometres were cycled and over 5,000 euros were raised in donations. This year’s CAD Schroer sponsored cycling was the fifth time we had done such a thing, and it’s managed to establish itself over the years. Staff at CAD Schroer cycled to work for a month. CAD Schroer donated 50 cents for every kilometre cycled: the more kilometres cycled, the higher the donation. Over 8,000km were cycled during this month of donations. Even more donations from sponsors were added to that. Through the sponsored cycling initiative, CAD Schroer has managed to support the refugee relief charity Der Bunte Tisch Moers e.V with over 5,000 euros this summer. 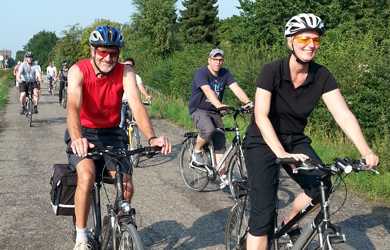 “We used the good weather and the relevant cause to motivate our staff to cycle to work during the entire summer. The highlight was our cycling tour, which we did together and alongside some of the refugees housed in Moers, as well as the closing barbeque party, where we learnt a lot about their situation and made new friends”, explains Michael Schroer. “The outcome of the sponsoring has been overwhelming,” adds Michael Schroer. “The sponsored cycling proved to be a huge success thanks to the great commitment of our staff. We wanted to help young refugees participate in society and provided them with bicycles for this purpose. 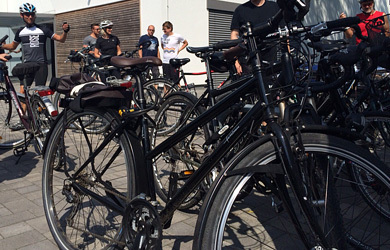 We’ve now been able to put our plans into action and present them with 50 bicycles for their daily mobility”.